Harnessing technology found in the flagship EOS C500, the EOS C100 Mark II boasts a powerful imaging engine which delivers outstanding performance. A Canon Super 35mm 8.3MP CMOS sensor combines with a DIGIC DV 4 processor to deliver the rich colour and wide dynamic range synonymous with Cinema EOS cameras, while a new extended ISO range of 320 to 102,400 ensures superb performance, even in extreme low light conditions. The camera also features a new image processing system which enhances performance further by reducing moiré and aliasing, resulting in sharper, clearer images. The EOS C100 Mark II features two recording formats to suit the needs of different productions. Dual Format recording allows operators to simultaneously capture Full HD footage in both MP4 (up to 35Mbps) and AVCHD (up to 28Mbps) variants, using frame rates of up to 60P. Alternatively users can chose to record HD and SD footage to separate SD memory cards for maximum workflow flexibility and easy sharing. 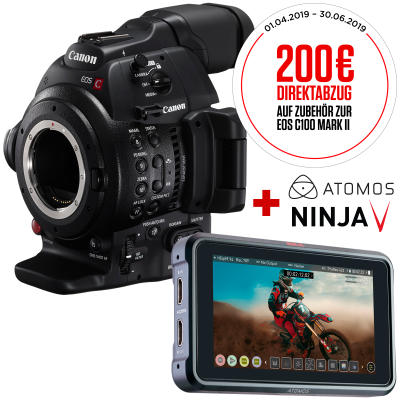 This range of options further expands the world of creative opportunities offered by the EOS C100 Mark II and also makes the capture of slow and fast motion action possible. Integrated Wi-Fi connectivity – a first for the Cinema EOS series – ensures that sharing footage from the camera is now easier than ever thanks to ability to transfer files via FTP. In situations that demand a fast turn-around, such as news or events reporting, Dual Format recording allows operators to quickly share low resolution SD files directly from the camera whilst the security of an HD copy is maintained. Thanks to its robust, compact design, the EOS C100 Mark II is ideal for shooting in a wide range of applications, especially those involving a single shooter. Browser-based camera control via built-in Wi-Fi and support for Canon’s multi-functional RC-V100 remote control allow the camera to be positioned in locations that previously could not have been considered, enabling crews to maintain creative control even in the most awkward or obstructive situations. As part of the EOS system, the EOS C100 Mark II is immediately compatible with – and optimised for - Canon’s world-renowned range of interchangeable EF lenses and 4K EF cinema lenses, providing both the power and versatility to meet virtually any creative challenge.